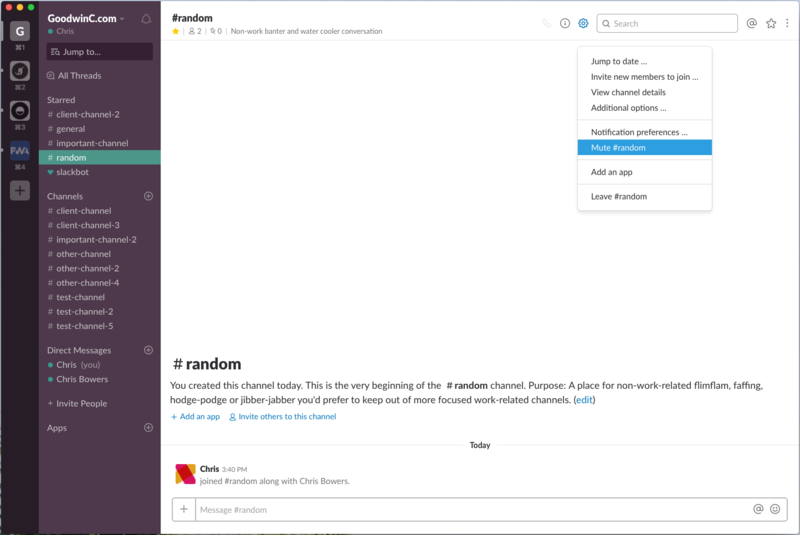 Slack can be pretty overwhelming if you don’t take a bit of time to set it up to work for you. I’ve put together a few easy to follow recommendations to organize, optimize, and help you to be as productive as possible. You don’t need to know every time something happens everywhere. Set up push notifications to work for you by changing to be notified only when people mention you. You can also listen for specific keywords. In this case, ‘cat pics’ are very important. 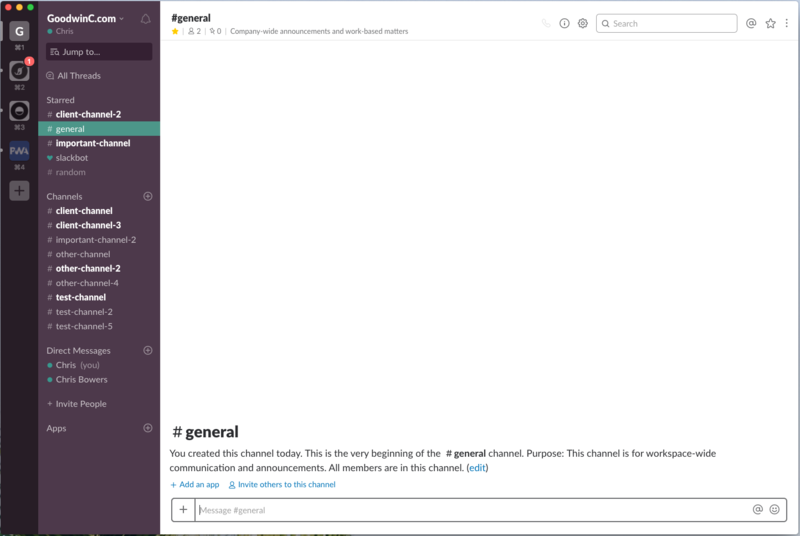 You can mute individual channels in slack that you may not want to leave completely. You can also unmute by clicking that same icon. 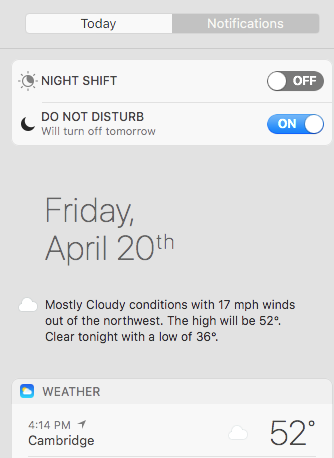 You can also hold option when you click the sidebar icon to turn on Do Not Disturb without all the extra scrolling. Note: It’s easy to forget you’ve turned on Do Not Disturb so I’d recommend installing an app like Muzzle to hide your notifications when you’re in meetings or sharing your screen. 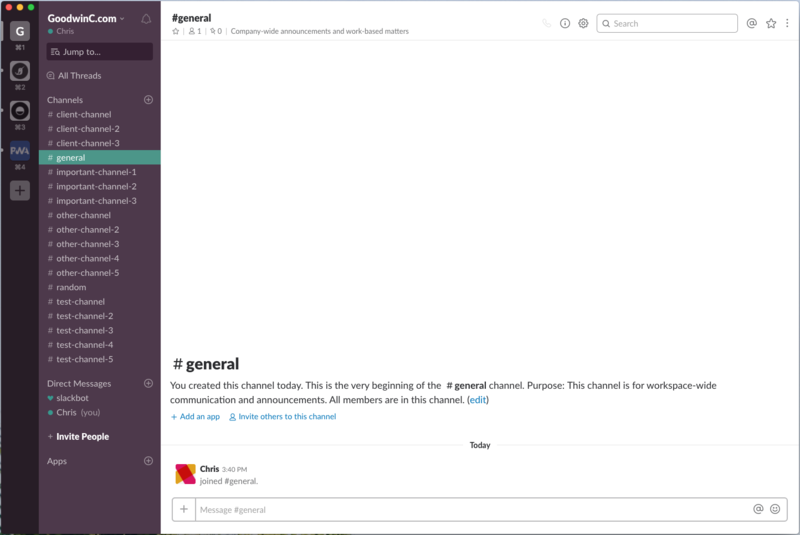 Starring is great for keeping track of important channels and people but be careful not to star everything. Only star people and channels that are truly important to your day-to-day work. If you have channels you want to stay a part of, but you don’t think are important enough to star, you probably don’t need to see them adding clutter to your sidebar if there is nothing new to read. This might seem obvious, but it’s very likely you’re part of channels you don’t need anymore. Keep some of the fun ones around but feel free to leave everything that isn’t relevant to you. You don’t have to be part of every conversation. You can also click the ‘Jump’ button to go directly to those posts. 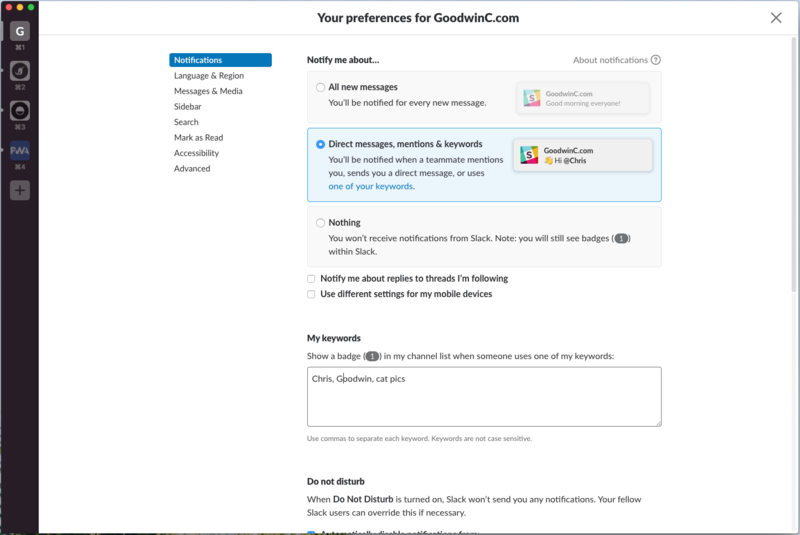 There’s a ton of ways to navigate the entire interface with keyboard commands only. This might be overkill for some users but once you get the hang of them you should be able to move through the interface even more efficiently. Some people really don’t like their computer to make any sounds. You can mute notification sounds but I’d recommend holding off on it as you’re getting up and running. If you find they are annoying you, you can always toggle them off later. 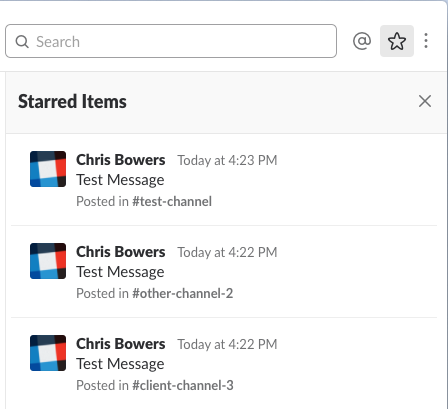 You can set up email notifications to allow you to remove yourself a further step from channels while still having some insight into them. Though, this can get out of hand if not used sparingly. 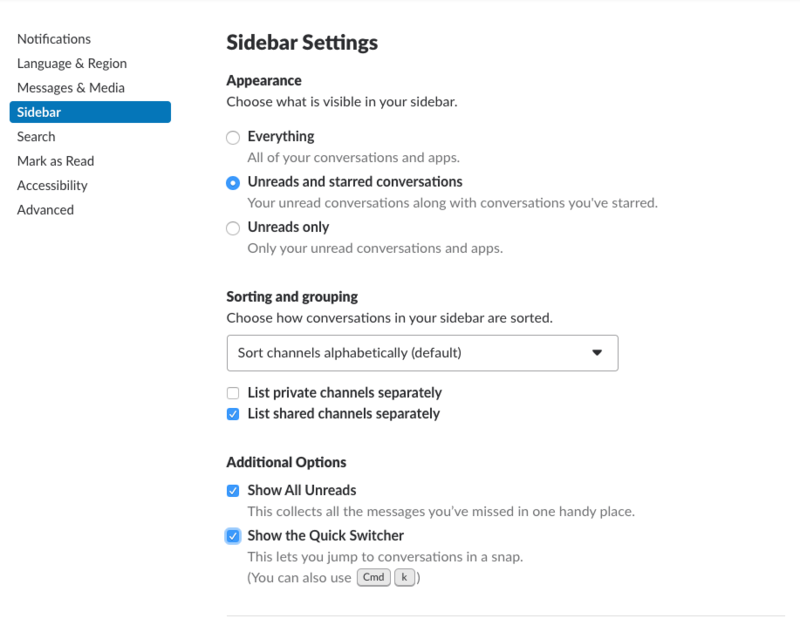 With these tricks and tweaks it should be easier to remain productive while connected to everything you need. 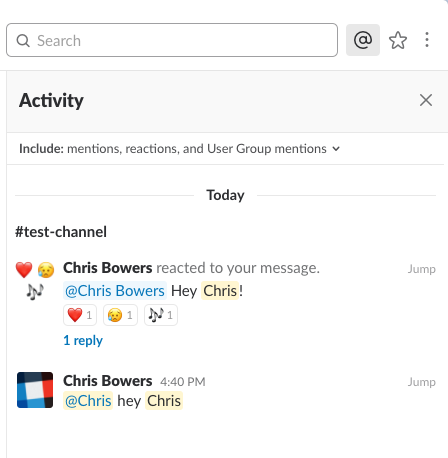 Here’s to a slack that works for you!